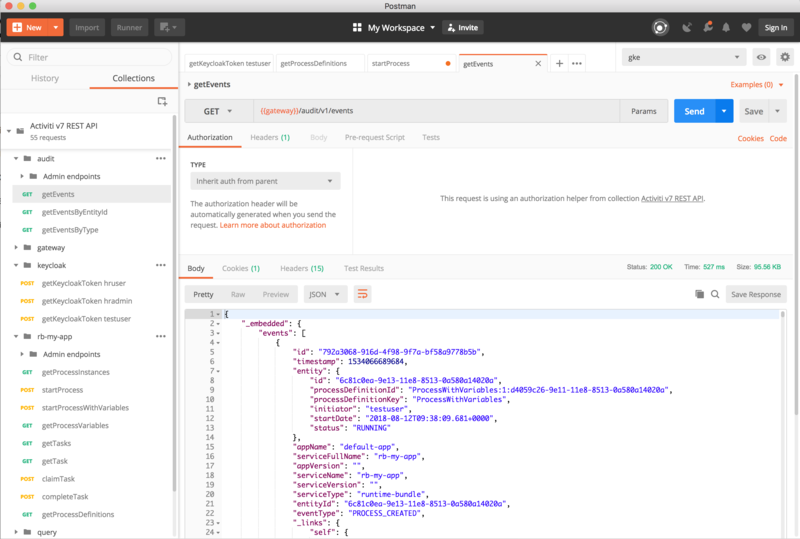 We have just released Activiti Core and Activiti Cloud 7.0.0.Beta1to Maven Centraland we wanted to highlight the new Cloud Native capabilities of Activiti Cloud. 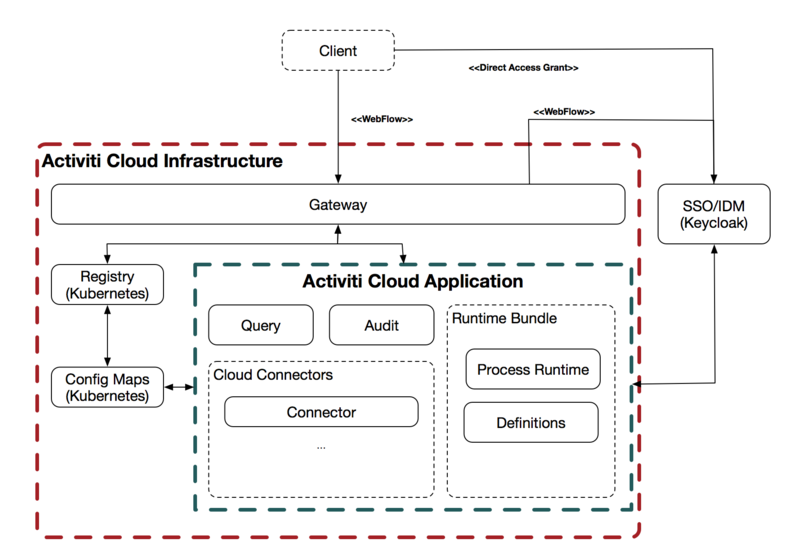 For those who haven’t followed what we have been doing over the last year, Activiti Cloud is a set of Cloud Native components designed from the ground up to work in distributed environments. 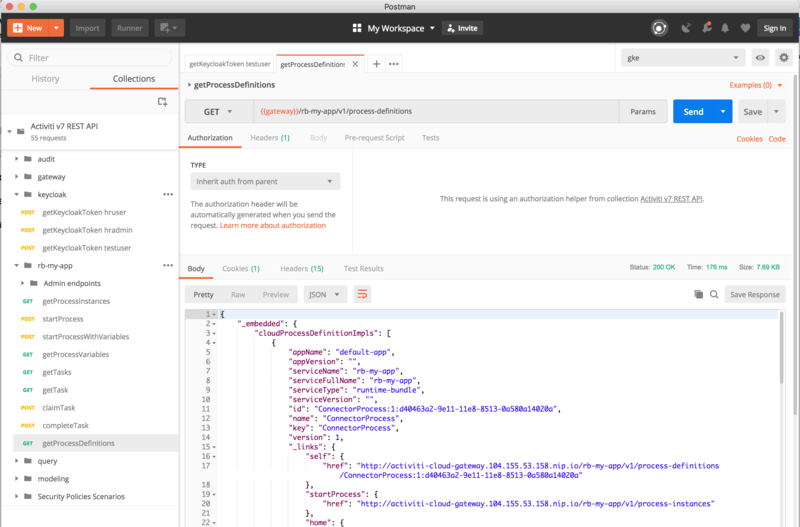 We have chosen Kubernetesas our main deployment infrastructure and we are using Spring Cloud/Spring Bootalong with Dockerfor containerization of these components. We have gone through a very valuable journey, meeting very passionate developers, communities and existing and potential customers who are looking to leverage these technologies (and business automation solutions) to reduce time to market and improve business agility in the Cloud. We have also contributed with these communities, making sure that the Open Source projects that we consume get back our valuable feedback and contributions. These Building Blocks are Spring Boot Starters that can be attached to any Spring Boot (2.x) application. These Building Blocks are enhanced with Spring Cloud functionalities which provide the Cloud Native capabilities. Let’s get our hands dirty with Kubernetes, HELM and Activiti Cloud. As part of the Beta1 release, we have created a set of hierarchical HELM charts that can be used to deploy several components, some related to infrastructure (such as SSO and Gateway) and some Application specific components like Runtime Bundle, Audit Service, Query Service and a Cloud Connector. These HELM charts can be found here: https://github.com/Activiti/activiti-cloud-charts. One important thing to notice is that each of the Activiti Cloud components can be used independently. This example is intended to show a large-scale deployment scenario. You can start small with a Runtime Bundle (which provides the process and task runtimes), but if you want to scale things up you need to know what you are aiming for, and this charts shows you exactly that. And as I mentioned before having a real life cluster is recommended. Before we start, make sure that you clone the https://github.com/Activiti/activiti-cloud-chartsand go to the “activiti-cloud-full-example” directory, we will use some files from there. Enter the Cluster Name, select the Zone based on your location and I’ve selected 2 vCPUs and left the Size to the default value (3). This will open a popup to show you how to connect with the cluster, open a terminal and copy the command that was displayed in the previous pop up. Now you have your Cluster configured and ready to be used. Note: If you are working with an existing cluster, you will need to check if you have an Ingress Controller already installed, you can skip the following steps if that is the case. 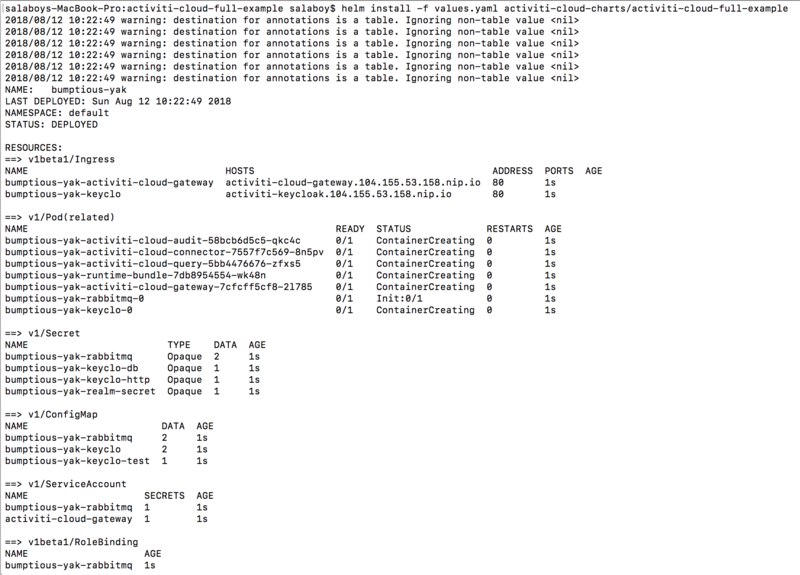 Now let's configure HELM to work in the Cluster. Notice that you might need to run kubectl get services serveral times until you can see the External IP for your ingress controller. If you see PENDING, wait for a few seconds and run the command again. Now that we have our Cluster in place, HELM installed and an Ingress Controller to access our services from outside the cluster we are ready to deploy the Activiti Cloud Full Example HELM Chart. The next step is to parameterize your deployment to your cluster. The Activiti Cloud Full Example Chart can be customized to turn on and off different features, but there is one mandatory parameter that needs to be provided which is the external domain name that is going to be used by this installation. In order to do this, you can copy or modify the values.yamlfile located here: https://github.com/Activiti/activiti-cloud-charts/blob/master/activiti-cloud-full-example/values.yaml. You need to replace the string “REPLACEME” to <EXTERNAL-IP>.nip.io. 104.155.53.158.nip.ioin every occurrence of “REPLACEME”. 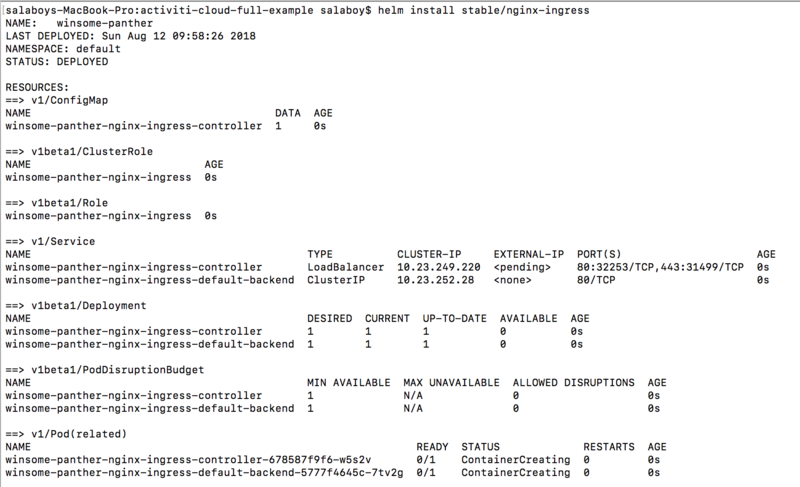 Notice the READY column 1/1 in all the pods, that means that we have 1 pod in Kubernetes running our service. It is also important to notice that HELM created a release of our CHART. Because we haven’t specified a name for this release HELM choose one random name, in my case, it was: bumptious-yak. 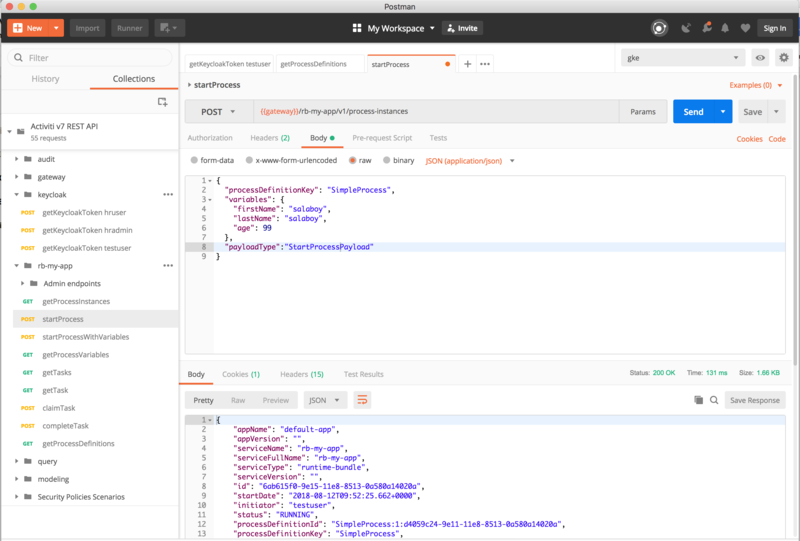 This means that we can manage this release independently of other Activiti Cloud Applications that we want to deploy using the same approach. You can run helm list and then helm delete to remove all the Activiti Cloud Services for this release. As shown in the previous screenshot, if you go to the keycloakdirectory and select the “getKeycloakToken for testuser”you will get the token which will be used to authenticate further requests. Notice that this token is time sensitive and it will be automatically invalidated so you might need to get it again if you start getting unauthorized errors. You can check that the audit service contains the events associated to the just started process instance. You are now ready to start consuming these services to automate your own business processes. 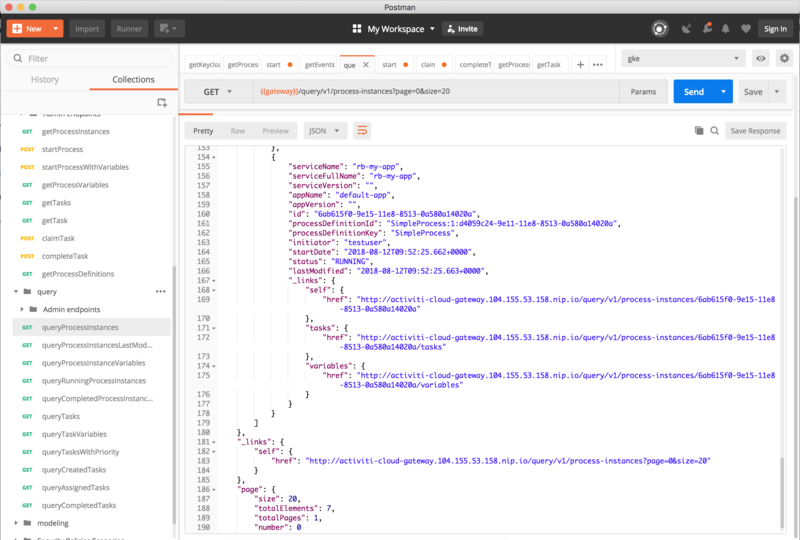 All our services are using SpringFox to generate this documentation and provide a UI for it. 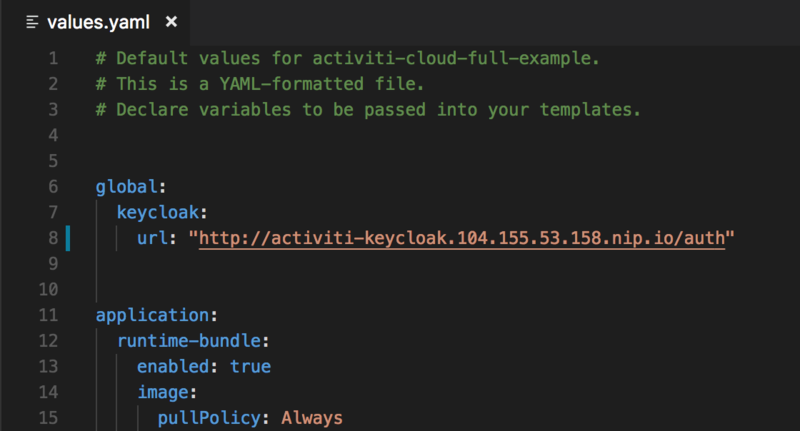 In this blog post we have seen how to get started with Activiti Cloud and more specifically with the Activiti Cloud HELM charts in GKE. If you are not familiar with Kubernetes, Docker and GKE this might look like a lot of new information and it is our mission to simplify all the steps covered in these getting started guide. For that reason, we recommend you to checkout the Jenkins Xproject, which greatly simplifies the first two sections about creating clusters and configuring the basic infrastructure for your projects. As part of the Activiti Cloud initiative we are making sure that we follow best practices coming from the Kubernetes, Docker and Spring Cloud communities and we are contributing back with fixes and feedback to make this technology stack the best for Cloud Native applications. As always feel free to get in touch with us via Gitter: https://gitter.im/Activiti/Activiti7?utm_source=share-link&utm_medium=link&utm_campaign=share-linkif you have questions or feedback about these examples and tutorials.